Yup. Salma Hayek is still pregnant. No news here. So, I will take this opportunity to provide advice. I’m helpful, right? 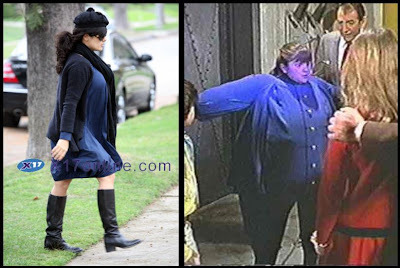 Rule #4,742: “If you are gaining weight due to pregnancy or other circumstances (you enjoy Devil Dogs), please stay away from clothes that make you look like a life size piece of fruit (i.e a blueberry). Please note, this rule does not apply if you happen to be dressed as a piece of fruit, intentionally, in a Fruit of the Loom commercial. Pencils down. Class dismissed. James Blunt to Victim: You're Crippled. You're Crippled. It's True.